From the studio behind Tokyo Ghoul and Fushigi Yugi comes the story of Yona of the Dawn, a typical teen - easily excitable, spoiled by her adoring father... and the sitting princess of the Kohka Kingdom. On her sixteenth birthday she plans to tell her father, the kind King Il, about her hidden love for her childhood friend, Su-won. But before she can confess her feelings, she stumbles upon her father being brutally murdered by none other than Su-won himself for the purpose of ruling the kingdom with a firmer hand. After the tragic discovery, Yona and her bodyguard Son Hak must flee the kingdom and escape the wrath of Su-won’s henchman. 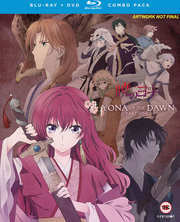 Now, in order to reunite the fallen kingdom, Yona and Son Hak are on the hunt for the four legendary dragons of Kohka. Along the way, Yona must shed her royal air and learn to live by the sword and bow.